With Island locals and visitors faced with a diminishing amount of free parking and ever increasing parking charges, never has there been a better time to consider bus travel on the Isle of Wight. Today the average car owner can expect to pay out £2,300*per annum for their vehicle, covering road tax, insurance, repairs, fines, MOT and fuel. Adding to this annual running cost are daily parking charges, now up 23% across Isle of Wight long and short stay car parks. If not provided with off road parking at their place of work, employees can now expect to pay up to £7 for 6 to 10 hours parking in a long stay car park on the Isle of Wight – adding an additional £35 a week to vehicle running costs. That’s an additional £1,610 per annum in parking costs, based on an average 46, five day working weeks in a year (230 working days). 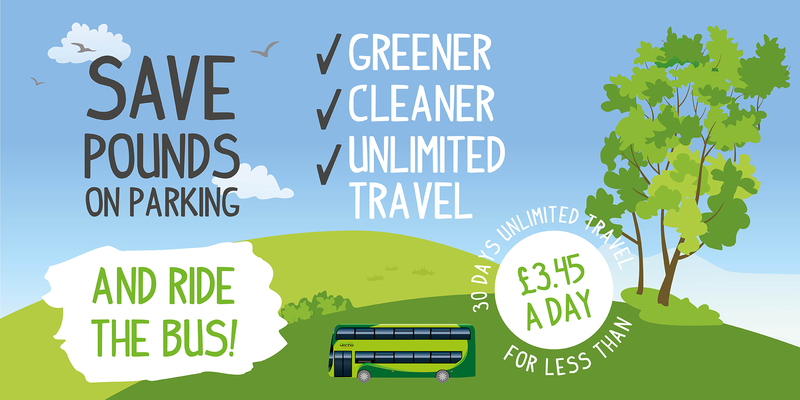 By switching from car to bus, a more sustainable mode of transport, customers can reduce all monthly travel costs to just £88 a month with a 30 day Freedom ticket, offering 30 days unlimited travel for just £2.93 a day. This ticket is valid for use on 30 consecutive days. For unlimited bus travel when you need it, customers can make use of our 30 day multi-day bundle. Available on the Key and via our mobile app, the multi-day bundle offers 30 days unlimited travel with no restrictions on usage - your time, your travel, your way. At £103 the 30 day multi-day bundle offers commuters using the bus five days a week, unlimited travel for six weeks - working out at £3.43 a day, £68.60 a month (20 days) and £788.90 a year (230 days). With unlimited fares available for around £3.50 a day, bus travel costs significantly less per day, week, month and year than Isle of Wight parking charges - and without the running costs of a car. One full double decker bus can take up to 75 cars off the road every day, reducing harmful emissions and congestion. Plus, the views are pretty great on the Island too, offering a rare moment for you. Read a book, enjoy a coffee, listen to music, catch up on emails, update your social – or just sit back and do absolutely nothing. Bliss. *As calculated in a poll of 2000 UK motorists by Autoeurope.